Two of the league’s new sides opened up the Trophyland Cup for the season as Division Four outfit Oak Royals hosted Asianos Reserves from Division Three at Newbury Park. And it was Oak Royals who shocked their higher league opposition with a late free-kick securing a 2-1 win for the hosts as Michael Cole and Jack Gotobed got on the scoresheet. An entertaining game in the Premier Division saw Downs host Valentines United at the Flats yesterday morning. A topsy-turvy game saw both sides lead at different stages but ultimately ended in a 3-3 draw courtesy of Downs goals from Daniel St. Louis, Khadean Campbell and a late equaliser from William Fu. Korona Redbridge are the new leaders in Division One as they travelled to former leaders Aldborough Hatch and secured a closely fought 4-3 win to retain their unbeaten status. Dawid Pietras scored twice adding to goals from Adam Waclawczyk and Zoltan Rozsa to secure the points, cancelling out a Hatch brace from Stephen Barnes. If it’s entertainment you want, get a Barking season-ticket. In four games, they’ve notched 29 goals already and let a few in too! Sunday was no different as they battled to an astonishing 9-6 win over Emerson Park, a game which would see Alan Hansen pulling his hair out. Charlie Surridge and James Jacobs both scored twice for Barking with singletons from Pa Ceesay, Daniel Cook, Michael O’Brien and Kastriot Vata completing the scoring. Keeping apace with the front runners are Barking & Dagenham Wanderers who secured a third victory of the season with a narrow 2-1 win at Valley Park. Goals from Andre Gumbs and Daniel Kika led the way for Wanderers, rendering Chris Turner’s strike for Park just a consolation. Warren United Reserves picked up an important first win of the campaign as they hosted bottom side Dagenham United at Old Parks. Doubles from Daniel Dryan and Connor Smith were the difference with Conor Tallon also netting to take home maximum points. 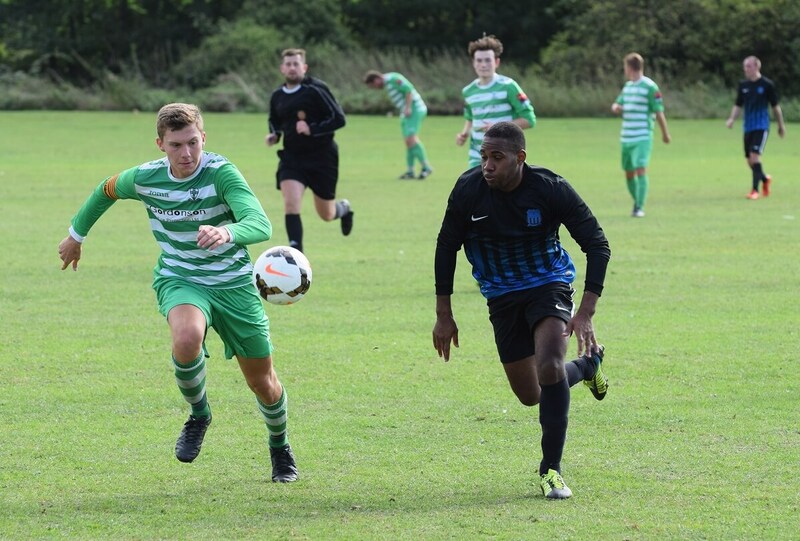 And rounding off the action from Division One was a second successive win for Chingford Celtic as they saw off the efforts of St Augustines in a 2-1 victory. Duane Hitchman was the man finding the onion sack for the Saints but wasn’t enough as Chingford confirmed the points heading back to E4. Park Tavern continue to show why they were one of the bookies early favourites for glory this season with another win, this time a 5-2 victory over fellow Dagenham outfit, Morfdown Elect. Goals from Kristopher Brown, David Hornsby, Greg Saunders, Nicholas Tormey and George Nobbs were the difference on the day as they won to maintain their unbeaten record so far. Keeping them company at the top of the table are Waltham Athletic who don’t do things the easy way. Opponents Romford Galaxy were quick out of the blocks and went 2-0 ahead before being pegged back to 3-2 down by Waltham. But Galaxy rescued a vital point in the dying minutes to share the points in a 3-3 draw. A Paul Cutts brace and a Luke Gray goal accounted for Galaxy’s tally with Tom Simon, Charlie Saywood and Zachary Leitch levelling the soreline. Westferry Elite have moved up to fourth place in the table after edging out a close encounter with Lonsdale at Parsloes. Lonsdale goals from Anton Gjergji and Rory Treadwell proved not quite enough as Elite came through to secure maximum points. There was a first competitive victory for Docklands Albion on Sunday as they finally secured a win at the fourth time of asking. Their 1-0 win against FC Mexico saw an end to their opponents’ unbeaten record with Julio Joffily scoring the all-important goal to secure the points. Also picking up a first win of the season were the London Fire Brigade as they travelled across the hedge to Ilford Wanderers to face E4 Rangers in a real six-pointer of a match. Goals from Sam Redfearne and William Boulton were just enough to see off efforts from Shaun Friel and Ashley Mills for E4 and take home the points. Division Three is shaping up to be a really competitive division as the top two sides maintained their positions with victories. Wanstead United, the current leaders, scored the only goal of a very close match with AC Milano Reserves as Jason Branche’s strike made the difference in a 1-0 win. An equally tight match in Waltham Abbey saw hosts Upshire Reserves take on high-flying Alliance United in a mouth-watering clash. A match of the highest quality saw both sides have and squander a hatful of chances before a contentious moment twenty minutes from time saw Jack Marrion net from the spot to bag a 1-0 win for Upshire. Alpha secured a first league victory of the season as they beat last season’s cup finalists, FC United of Hornchurch, by four goals to nil. Alpha goals from Roy Edmans, Ashley Godwin, Reece Simpson and Brentton Barrett proved the difference between the sides as the visitors wrapped up a comfortable victory. Also moving up the table are Ridegway Rovers who are now up to fourth in the table on goal difference following a narrow 2-1 victory on Sunday over Fairlop Rangers in Chingford. SL Menfica look to be an unstoppable force in Division Four as they wrapped up a fourth win in four, defeating Chinglow 13-0. New signing Jordan Clark scored a hat-trick on debut with Jake Muller and Thomas Rice also netting doubles for their side. And rounding off the scoring for the leaders was goals from Lewis Clark, William Sheehan, James Dobson, George Boffa, Flynn Linard and Richard Beard. Epping Forest Falcons move up to fourth place in the table after a 3-1 win over Central Colts at Castle Green. The Falcons goals were scored by Ryan Lawless and Gary Sare to take home the points and get back to winning ways. A tightly contested match at Warren School saw Goresbrook and Heathside battle out a five-goal thriller. Goresbrook goals from Samuel Berry and Charlie Barrett were cancelled out by strikes from Craig Ellis, Jamie Crews and Glen Owen to secure an important victory for Heathside who move second in the table ahead of a match against the league leaders on Sunday. Premier Division side Quality Control travelled to Harlow to take on Pools Athletic on Sunday with a place in the second round at stake for the winners. Having battled back to the take the game to extra-time following a 2-2 draw, Quality unfortunately saw their involvement halted in a penalty shootout as they went down 4-2.